Water, the worst contaminate in all fuels, builds up in every fuel tank every day through condensation. Water reduces the heat of combustion which means more smoke, less power, hard starting, rough idle, poor mileage, winter freeze-ups and microbe growth. 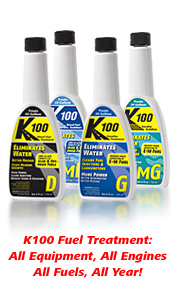 K100 Treatments, which are complex organic compounds, have a strong hydrophilic attraction to water. K100 seeks out water droplets, breaks the bond between adjacent water molecules, and permanently bonds itself to the individual molecule. The water molecule becomes encapsulated by a combustible shell and is heavier than the fuel, so it sinks. When the fuel is agitated the encapsulated water molecules are dispersed throughout the entire fuel tank as an innerphase suspension and will pass through any standard water filter. Over time the water is removed as the engine runs, ”burning” it off. For more information or to purchase any of these items, please call us or send us an E-mail.